Earlier this month, we announced that there would be an Air Jordan 6 /7 Olympic pack that would be releasing next summer, to coincide with the 2012 Olympic games. Here for the first time, is a first look at the Air Jordan 6 / 7 “Olympic” Black / Gold Pack that will consist of the Air Jordan 6 Retro in White / Gold and an Air Jordan 7 that features a Black / Gold theme. 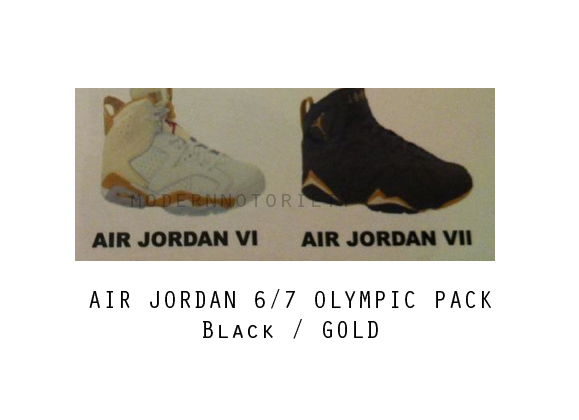 The Air Jordan 6 / 7 “Olympic” Black / Gold Pack will be releasing in August 2012. Stay tuned for more news on Jordan Brand Summer 2012 here on Modern Notoriety. Nice but lets not get all hyped up. I just want the 7's. FYI no they're not the sample of dmp 6s,… the sample were all white with gold midsole they look similar tho. idk about those 6's but I'll make them hot. them 7's dope though. the 7's go hard but the 6's look like crap. they really need another color instead of gold like silver. they would go hard if they was all white and had blk and silver for contrast.